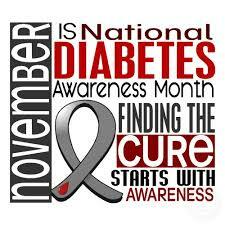 In case you didn’t know, November is National Diabetes Month and it’s almost over but before it the MedGift team has a question? Did you know this year’s focus has been promoting health after gestational diabetes (GD). Pregnant women with no history of diabetes but who experience high blood sugar levels during their pregnancy are said to have GD. Studies indicate approximately 2%-5% of pregnant women from the general population experience GD and the occurrence almost doubles with the risk factors shown in the table to the right. 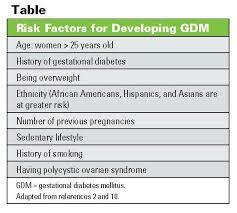 Furthermore, women who develop GD have a 50% chance of developing type 2 diabetes. Symptons of GD include: feeling thirsty even when you haven’t done anything, feeling fatigued especially early in the day and a dry mouth. Because these symptons can be subtle all pregnant women are screened for GD during the 24th and 28th week of their pregnancy. The screening test measures blood glucose levels. If left uncontrolled, the condition may be harmful — or even deadly — to both the woman and her child, and can increase both of their risks of developing type 2 diabetes later in life. The key to treating gestational diabetes is tightly regulating blood glucose levels through lifestyle changes (diet and exercise) and, if necessary, insulin injections. You have to cut simple sugars out of your diet Ladies. For a great overview of GD check out this article by the American Diabetes Organization. We hope you have had a great November and will have a safe, happy holiday season. Back at you in December!